The Banquet is one of the celebration events which is most often used for organizing weddings, birthdays, celebrations, private and corporate events, anniversaries, etc. Until the XIX century the word "banquet" was used relatively rarely, banquets themselves in the usual sense there were organized not often. The aristocracy used to have "dinner". But at the end of XIX century the banquets became very popular. The traditional banquet time was also become popular at the end of XIX century - 7-8 pm. In accordance with the etiquette the guests settle themselves at the festive tables. If you have scheduled a presentation or a reception on the anniversary of the company, the fourchette is exactly what you need. The cooks decades perfected their skills of preparing snacks, making it into an art, a standard of culinary design when unsurpassed masterpieces were created from ordinary products. It is a great custom which from the gastronomic Mecca - France - has spread around the world. 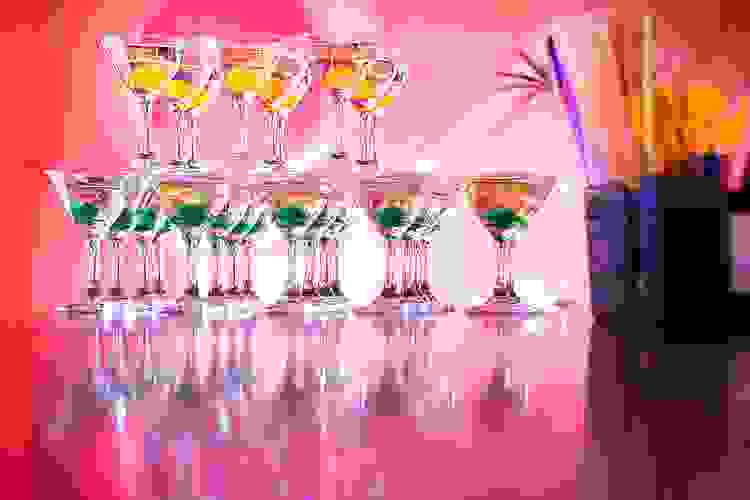 Fourchette, cocktails, corporate evening reception - we have all these attributes of modern business life, which paint a busy day in an unforgettable celebration of bright colors. The fourchette is- an event during which the guests can freely move around the hall, communicate and share experiences. The fourchette dishes are placed as a smorgasbord. "Novas Banquet Hall" can organize all kind of fourchettes. 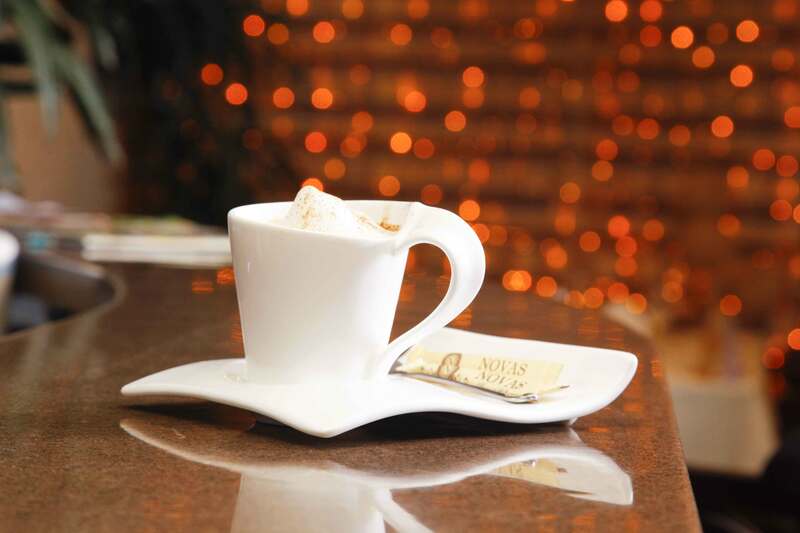 Coffee break is a break for pleasant and informal communication during some serious business negotiations, meetings, conferences and seminars, and other special events. In addition to coffee and tea the coffee break includes fresh pastries, croissants and delicate maffiny which will be appreciated by the guests of your event. 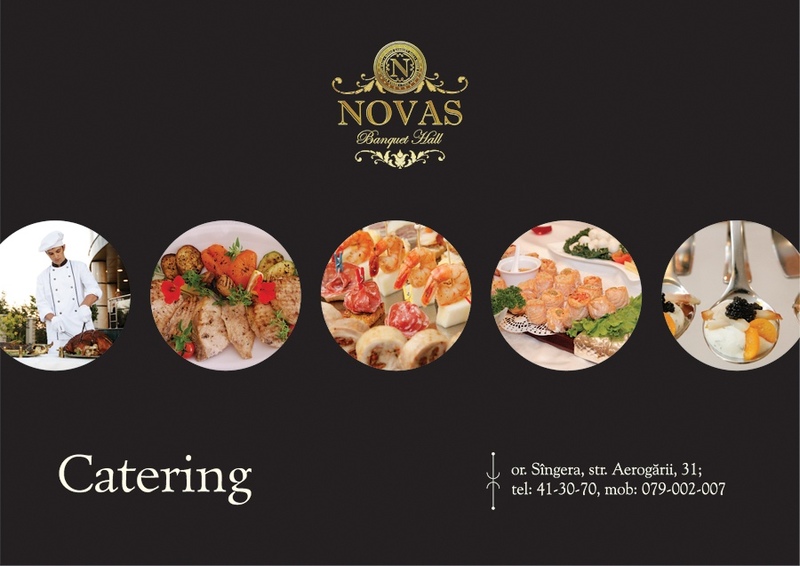 The employees of "Novas Banquet Hall" will organize a coffee-break which will be a harmonious part of your event scenario, the food will be delicious and the service we offer will be prompt ant professional. In many countries Cocktail is one of the most common types of receptions. Usually cocktail events are organized during congresses, exhibitions and other business activities. Cocktail is a simplified form of fourchette. During cocktail the fourchette tables are not used. The snacks are served on large dishes and the waiters offer them to the guests. As cutlery guests use appetizer pick skewers. Food is usually not served during cocktails. Your guests can enjoy fruits and snacks that will be combined with alcohol drinks. Novas Banquet Hall is expanding the spectrum of the services we offer by adding a new service, namely catering. Catering presumes the delivery and serving of food and drinks according to a restaurant’s standards. 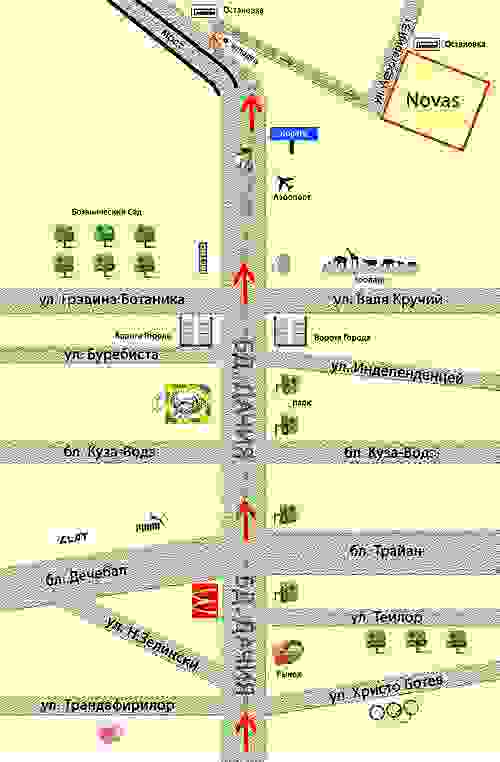 The delivery happens at the time and place set by the client with all the services a restaurant would offer. Catering offers a number of undeniable advantages: thanks to it you can organize anywhere and anytime : corporate events, presentations, annual holidays, anniversaries, weddings, proms and other events. If an ordinary restaurant limits you to a specific place, then catering is mobile and convenient. We deliver absolutely everything: from the equipment needed, furniture, dishes, to waiters, bartenders, chefs and managers. 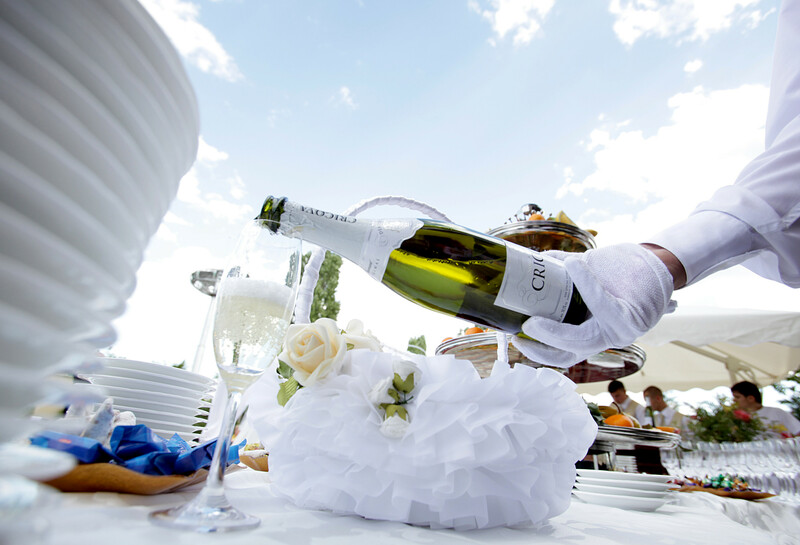 Moreover, these type of services can be offered in different ways: buffet, coffee break, barbeque, reception, banquet and cocktail bar. Our catering involves fast and high quality services. Novas Banquet Hall has the image and the reputation of a restaurant that has quite a few advantages. Among them is a professional equipment that allows us to cook and serve food at different events without losing the quality and taste of our delicious food. Another advantage that we are proud of is our professional and trustworthy team that will make sure to please your guests. 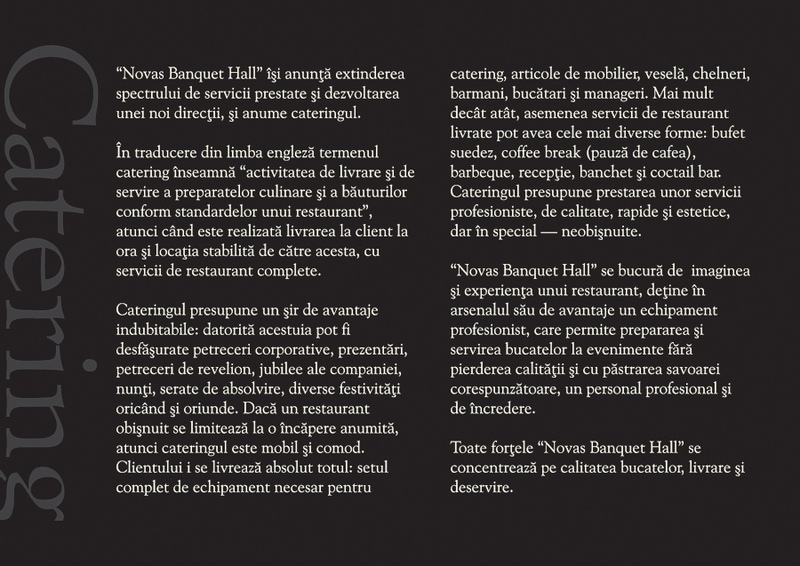 The high quality of our food, convenient delivery and top service is what Novas Banquet Hall is focused on. 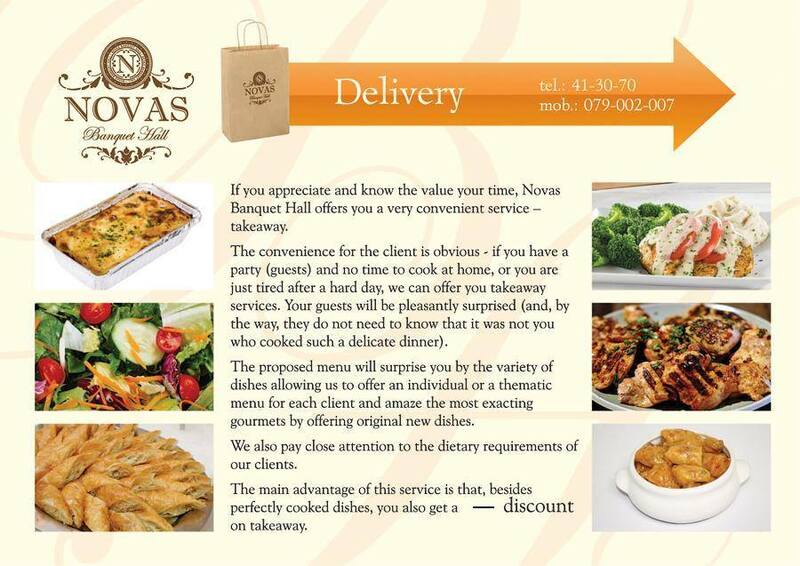 If you treasure your time, Novas Banquet Hall offers you a very convenient service – food delivery. The convenience that our clients are benefitting from is obvious: if you have a holiday but you don’t have time to cook or you are tired after a long day, we offer you to order the food to be delivered to your address. Your guests will be pleasantly surprised. And by the way, you don’t have to tell them that is wasn’t you who cooked such a delicious meal. You will be amazed by the variety of meals we offer- thing that allows us to make an individual menu or a themed one for each client. We can surprise even the most sophisticated and picky gourmands by suggesting them exquisite meals. We also pay attention to the needs of our clients that follow special diets. The main advantage of this service is that besides the delicious food you will also receive a discount on the delivered meals.